December 12, 2018. 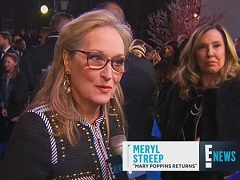 Meryl Streep is interviewed about her husband's birthday and her daughter's pregnancy at the London premiere for "Mary Poppins Returns". January 07, 2018. Meryl Streep and Ai-jen Poo, the executive director of the National Domestic Workers Alliance, are interviewed on the red carpet at the 75th Annual Golden Globe Awards. December 14, 2017. Meryl Streep is interviewed on the red carpet of the Washington premiere of "The Post". November 24, 2014. Interview with Meryl Streep to promote the theatrical release of "Into the Woods" in the United States. January 16, 2014. Meryl Streep is interviewed on the red carpet at the Critics Choice Movie Awards. December 17, 2013. Interview with Meryl Streep at the Los Angeles premiere of "August: Osage County". August 02, 2012. Tommy Lee Jones and Meryl Streep are interviewed to promote the theatrical release of "Hope Springs". February 27, 2012. Meryl Streep is interviewed after winning the Academy Award as Best Actress for "The Iron Lady". January 26, 2009. 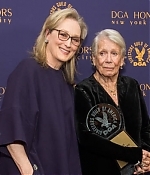 Meryl Streep is interviewed after winning the Screen Actors Guild Award for "Doubt". February 24, 2007. Spotlight on the Best Actress nominees for 2007, including an interview with Meryl Streep at the Golden Globe Awards.